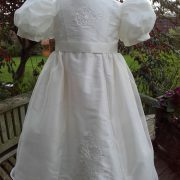 Heirloom Christening dress for baby girls. 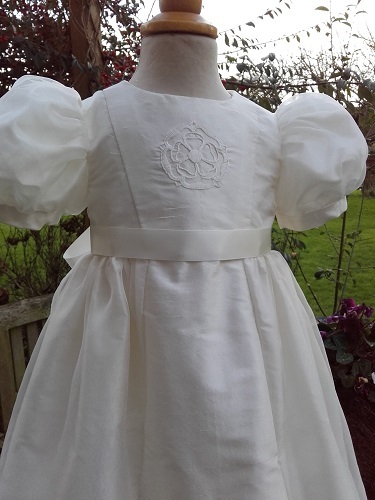 The Natalie Christening Dress has been designed with you and your family in mind. 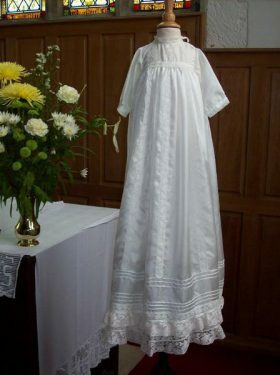 The front of this silk Baptism dress is decorated with hand embroidery which represents key elements of your heritage. 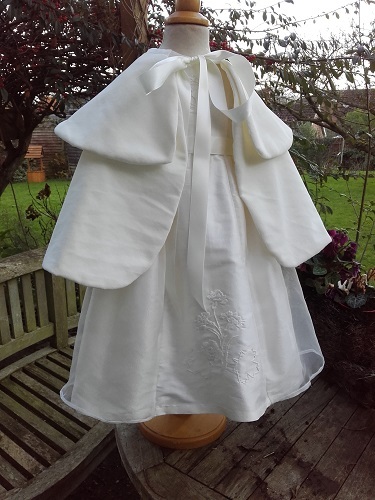 The result is a beautiful and shylish christening dress that will be treasured forever. 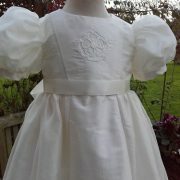 Designed by Linda Patrick the Natalie Christening dress has been created from silk dupion and silk organza. The bodice has a rounded neckline. 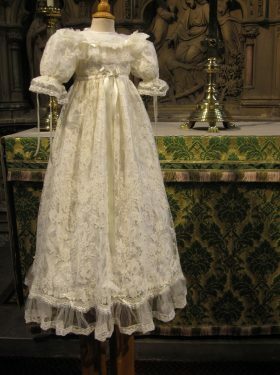 The sleeves are short and puffed to give a beautiful princess look to it. 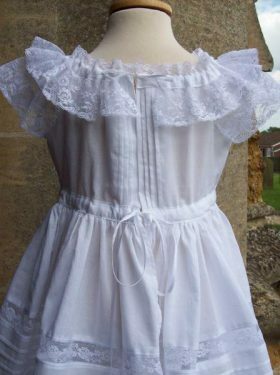 The skirt is fullsome and gathered to meet the bodice at the waist. But it is the front bodice panel and front skirt panel that sets this dress apart from the rest. 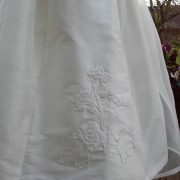 You see, the Natalie dress has the most exquisite hand embroidery added to it. 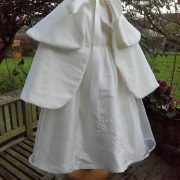 This dress emcorporates the English Rose, to reflect the birth of the baby in England. The Carnations on the front skirt reflect the birth month of the baby and the maple leaves reflect the birthplace of the father. 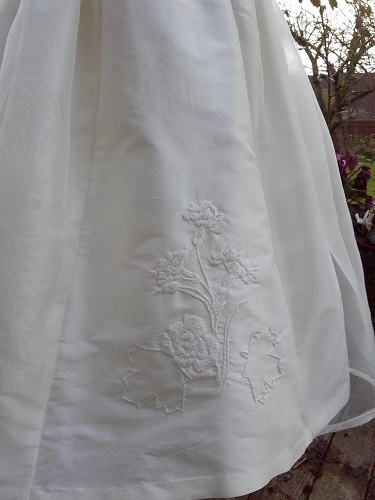 All these elements have been worked together to create this beautiful piece of bespoke hand embroidery. 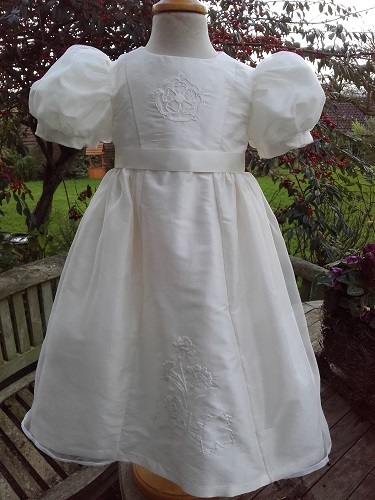 The result is a unique bespoke Christening gown created with love for you and your family. 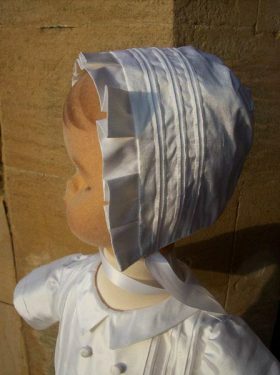 Complimentary bonnets, booties, personalised bibs and godmother handkerchiefs are also available.